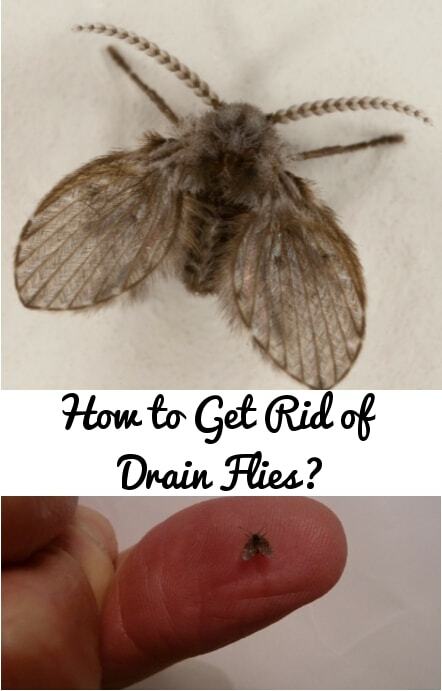 Get Rid of Drain Flies : Don’t know if you’re a victim of drain flies yet? Easy, we’ll tell you! If you spot flies resting on walls or ceilings near a sink, then there’s a good chance you’ve got these pesky little nuances swarming within your drain. A quick little test would be to cover the drain with sticky tape, if after a while you find flies stuck to the other side of the tape, then, yup, you’ve got them! A few home remedies to get rid of drain flies are listed below. This is by far one of our easiest remedies. It doesn’t involve cleaning out those pipes per se, so we reckon your hands will still be squeaky clean after being done with this little exercise. You will need a metal pipe brush for this remedy (nothing says scrub-a-dub-dub as does a metal pipe brush after all). So make sure to really scrub that drain back and forth for as long as it will allow you to. Follow this up by our ultimate exterminator, boiling hot water. This is bound to rid you of those pesky little files. Have you tried everything you could have possibly thought to get rid of those drain flies? Does the sight of them in your kitchen or washroom tick you off? Want to take some sweet, sweet revenge? Thought you might say yes! We’ve got just the thing. No scrubbing required, no washing required, nothing! In a bowl, place equal parts of sugar, water and white vinegar along with 5 or 10 drops of liquid dish soap. Place this bowl by the counter near the sink overnight. Flies are suckers for this little trick as they get attracted to the smell of the dish soap. Once they come in contact with the mixture, they drown and die of suffocation. 3. Good morning fly free kitchen! Drain flies or moth flies as they are commonly called, tend to breed in highly organic debris areas such as storm drains, rotten vegetation, sink drains and moist mops too. So it’s no surprise that these guys are always brewing up a storm within your pipes. This remedy is reserved for the end of the day, when you’re done letting these pesky little flies take over your kitchen. Pour equal parts of salt and baking soda along with one cup of vinegar down the drain, let this sit overnight. Top this off in the morning with a boiling pot of water! If you’ve spent the entire day, throwing a pity party for these little creatures with the hope that they’ll go away, how wrong are you! They don’t go away that easy, fluttering from one drain to the other, which you should have realized by now. So let’s trick these little suckers. Pour quarter of a cup of apple cider vinegar into a glass and wrap it tightly with plastic. Poke holes into the wrap with a fork or toothpick and place the glass next to the sink. Now sit back and watch as the flies drown into our sugary trap! 5. They’ll be sorry… eventually! This one is for the laziest of the lot. No time to find vinegar? Or baking soda? Or any other ingredients we’ve mentioned? Fret not, we’ve still got a way! You may not see obvious results right away, but we reckon it would not be too much of a problem to you. All you have to do is boil a pot of water and pour it down the drain twice a day for a week. Simple isn’t it? Here is another quick alternative which requires least effort. A natural product that goes by the name Bio-Clean is the solution to all your drain related woes. It works by eating away organic matter that clogs your drain. The minute that’s got, the flies too start to disappear. Must read: How To Get Rid Of Fleas & Ticks? So you have successfully gotten rid of them, for the time being at least. Follow up the pest eradication, so they don’t show up again. Pour half a cup of baking powder along with lots of warm water or a cup of white vinegar down the drain once a week. The idea is to prevent the flies from reappearing. Squeezing half a lemon down the drain could also help. What if it was never the drains? What if it’s from the exhaust? Should you call an expert already? That won’t be necessary, All you need is to burn some paper and create a little bit of smoke to scare these critters dry! The smoke works miracles at eradicating these pesky little monsters. You’ll have to do this only when the exhausts are dry, preferably before you go to bed. Borax is a key component of dish washing detergent and boasts of insecticidal characteristics. So take an empty spray bottle, add a generous amount of dish washing liquid and pour in a couple of cups of warm water. Shake it all up and spray away. Spare them none! Nothing spells sweet, fun revenge like this one! Use a fly swatter to swat all those creepies away! Go to the drain region and squash all those flies with your newly acquired weapon. Eradication at its best. If you’ve got a smelly drain that you haven’t really cleaned out for ages, this might not be as fun as you think! Drain flies are a big no no. But you won’t need to call the pest control or maintenance staff. Easy and cost-convenient remedies is all you need to keep them away. Try these home remedies to get rid of drain flies and let us know which one of these worked out for you. nice post, expecting more posts……..